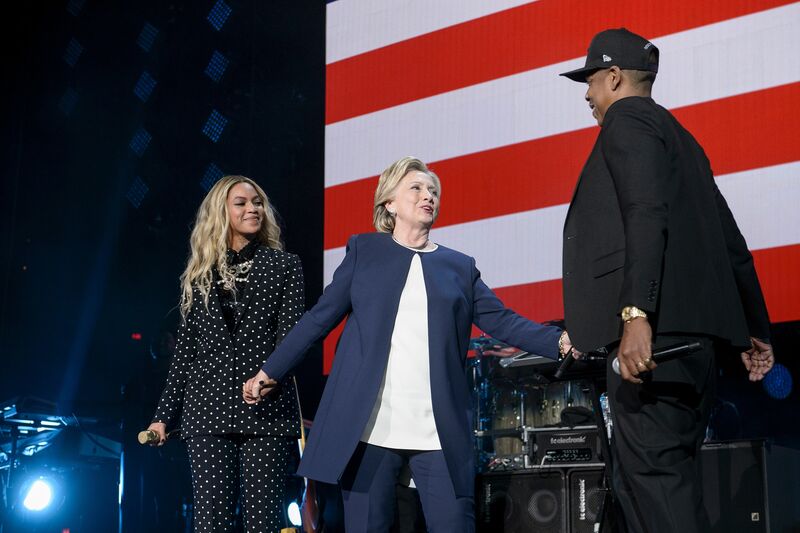 On Friday night, you could find the invincible trifecta that is Beyoncé, Jay Z, and Hillary Rodham Clinton hanging out in Cleveland, Ohio, at a rally intended to raise momentum for Clinton going into Election Day. "Less than 100 years ago, women did not have the right to vote. Look how far we've come," Beyoncé said in a speech about Clinton prior to her performance. She went on to perform in a custom-made pantsuit in a clear homage to Clinton. "I want my daughter to grow up seeing a woman lead our country, and know that her possibilities are limitless," Beyoncé told the crowd, referring to her child with Jay Z, Blue Ivy. "We have to think about our daughters." She went on to state clearly, "I'm with her." Clinton, meanwhile, quoted Jay Z at the crowd: "Rosa Parks sat so Martin Luther could walk," she said. Of Donald Trump, Jay Z told the crowd: "I don't have any ill will towards him, but his conversation is divisive." He went on to say: "He cannot be our president." "Once you divide us, you weaken us," he said. "We're stronger together," he added, invoking Clinton's campaign slogan, Stronger Together. Meanwhile, Trump seemed sulky at his own rally Friday night in Pennsylvania. "By the way," he huffed, "I didn't have to bring J. Lo or Jay Z." He continued: "Just me. No guitar, no piano, nothing." Meanwhile, a photo of Beyoncé, Clinton, and Jay Z backstage prior to the concert was widely shared on Twitter. The three teamed up in a move to pull in more young voters on the eve of Election Day. Both Jay Z and Beyoncé urged the crowd to make sure they voted on Tuesday, November 8. Clinton has had more than her fair share of celebrity supporters this election cycle: Katy Perry, Lena Dunham, Meryl Streep, Elizabeth Banks, Sarah Silverman, and Amy Schumer, to name just a few. Trump, meanwhile, had a star of the TV show Duck Dynasty voach for him at the Republican National Convention.